Earlier today this video was published on YouTube. 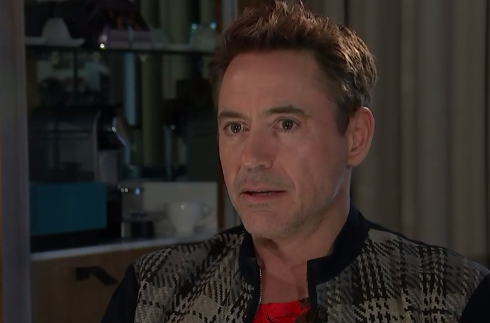 In it, Robert Downey Jr. speaks of his thoughts on super heroes, Iron Man as well as his latest film "Avengers: Age of Ultron". However the talented actor did not care for Krishnan Guru-Murthy's questions (along with most everyone who watched it) and he walked out early. This interview is so very full of nonverbal signals - below is a partial analysis of some of the more telling moments. Do you detect some signals of disbelief as well? His contempt is slightly more expressed - although still mild-moderate. Many would falsely label this a "bit of a smile" or a "polite smile" or "social smile". Note also his left eyebrow is further raised signaling incredulity (e.g., "I can't believe you're making this inference!"). [Prominent Head Shaking follows- a further incredulity signal, please view the video to see this dynamic]. What other nonverbal signals here telegraph some anger? Downey looks up and slightly to HIS left while temporarily focused at a distance. This is significant for Visual Recall when Guru-Murthy asks him about a quote Downey gave to the New York Times. He is trying to and/or visualizing the quote, in print, in his mind's eye. After the 5:00 minute mark, Mr. Downey's respiration increased. An even greater increase in his breathing is seen about 5:25 mark. 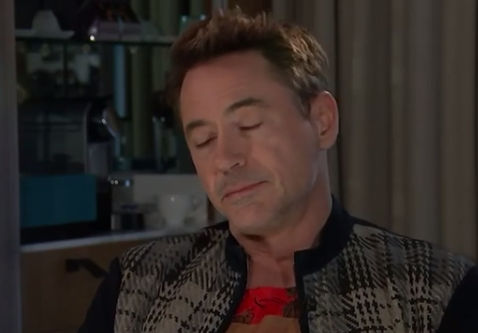 Robert Downey Jr. displays an extended blink as Guru-Murthy implies Downey's lack of comfort level with the subject matter. 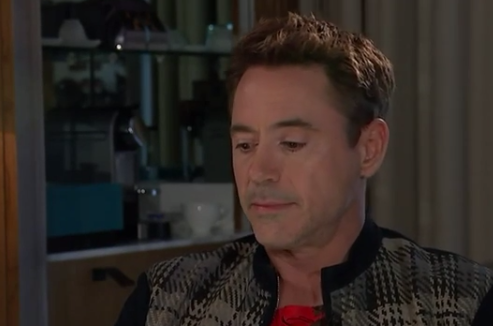 It's at this exact moment that Downey "Emotionally Red-lined" with respect to reaching the mental state of realistically walking out of the interview. 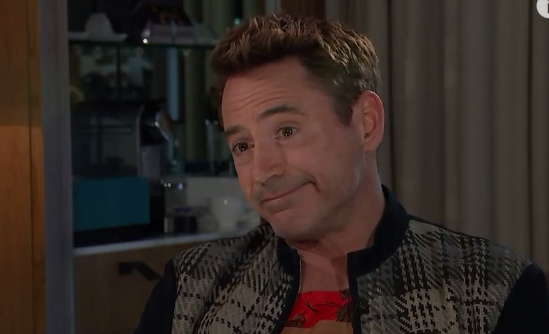 Robert Downey Jr. says, "Your foot is starting to jump a little bit, you better get to your next question." Note Downey's Deep Inhalation after his statement. When he is visible, Guru-Murthy's legs and feet were much of the time in motion along with frequent readjustments in his chair signifying significant anxiety. A greater increase in respiration is noted at about 6:00 - as Robert Downey Jr.'s breathing even becomes significantly audible. The Videographer notices this significant emotional change and thus zooms in. Clear defensiveness on the part of the interviewer as he crosses his arms across his chest. Jaw Jut displayed by Guru-Murthy - indicating significant anger.